I try my best to cook at least once a week. When I do cook, I also make it a point to do lots of veges. I like to experiment with salads and various homemade dressings, or do a regular stir-fry. 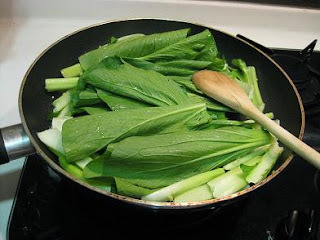 There's something tantalising about stir-fried leafy vegetables with lots of chopped garlic and a pinch of salt. It is so simple to do and yet so delicious. 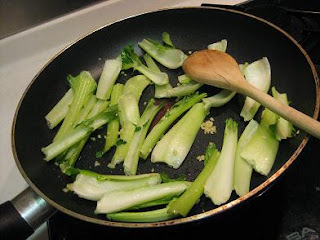 That's how i do my stir-fry vege too- just garlic and salt. this looks exactly like what we cooked a few nights ago! when J forgot to chop the vege more than once! myeisha: It it the simplest way to do veg and I always love it this way. poiemakoinonia: Are you referring to the leaves? I purposely leave them like that coz I like them big :) More to bite!